Once again the proof of how goods are overtaxed in Brazil, resulting in super high prices that keep people from buying things they need/like and making them pay their bills through installment plans with skyrocketing interest rates. 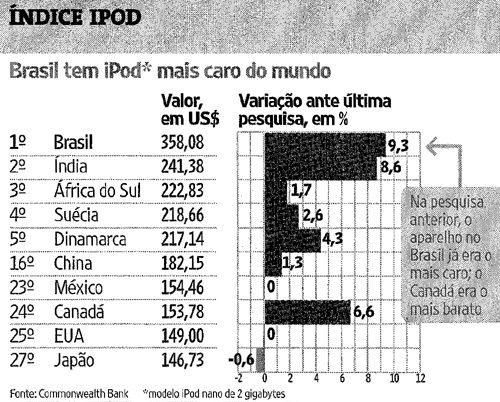 *Source: Brazilian Newspaper “Folha de São Paulo”, May 23rd 07 [Brasil continua a ter iPod mais caro do mundo]. You are currently browsing the archives for the prices category.